The Bible is a storehouse of divine truth which will repay reading whether it be approached merely because of its literary value, its ethical teaching, or its practical bearing on everyday life (e. g. the Proverbs). But for those who are prepared to study the contents of this wonderful volume with the object of learning what God desires of them, it offers present and future blessings beyond the ability of man to assess (Rev. 1:3), for “eye hath not seen, nor ear heard, neither have entered into the heart of man, the things which God hath prepared for them that love Him” (1 Cor. 2:9). This, however, requires study, that faith might be established and increased. “The natural man receiveth not the things of the Spirit of God, for they are foolishness unto him; neither can he know them because they are spiritually discerned” (1 Cor. 2:14). With study there will be developed a love for the Book, and for its Author whose love will be revealed therein, and by this influence the Reader will be led to radiate that same love to others. Therefore, this divine Book is the greatest power for good in the hands of man — if it be read with understanding. “All Scripture is given by inspiration of God, and is profitable for doctrine, for reproof, for correction, for instruction in righteousness; that the man of God may be perfect, throughly furnished unto all good works” (2 Timothy 3:16). In 1610, an event took place in Great Britain, destined to greatly influence the character and history of the English-speaking world. 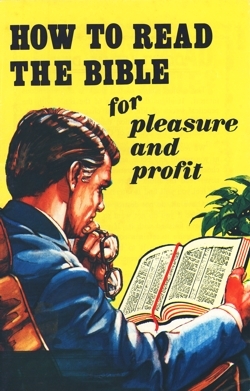 The Authorised Version of the Bible in English was published for the first time. It was designed for use by all: from the common laborer to the learned scholar; and though, for a time, the public did not quickly respond to its use, ultimately it became generally accepted, to help mould the lives of millions of people. Many words, expressions, and sayings of the English language have their origin in this version of the Bible. Most significant of all, it has revealed to many the requirements of true worship, and shown the way to life eternal. It can have a profound influence upon us, so governing our lives that it becomes more than the Bible, and can be viewed as our Bible. It can provide personal comfort now, as well as leading to life eternal in the future. Many have endured bitter persecution and death itself rather than turn from the teaching of the Bible. It has meant more than life itself to them. Why? Because, having read it with understanding, it has enabled them to live with purpose in view, providing them with a source of happiness for the present, and stimulating faith and hope for the future. They have “tasted and seen that the Lord is good” (Ps. 34:8); and having been strengthened to cope with life’s problems and frustrations, have learned to live richer, more satisfying lives as a result. What a contrast this is to the hopeless, aimless wandering of most people. Many have cast off all recognition of God, or His word, and refuse to submit to His demands. Are they happier for so doing? By no means. They experience an insatiable hunger for something they know not what. In desperation they seek a form of escapism from the dull monotony of an existence without purpose. Many turn to drugs. Others, through sheer boredom seek to end it all. Suicide is becoming more and more frequent in this age of materialism which has debunked God. The Bible has the answer to some of the greatest problems of life today, if people would but turn to it. Parts of the Bible are not easy to understand. In fact, they are quite difficult, and some guidance is helpful. Some have felt shocked and disturbed by portions of what they have read therein; others have found some sections mysterious and perplexing. If that has been your experience, do not be discouraged; continue reading, continue to seek carefully for the basic message contained therein, for the prize is well worth while. But do not read impatiently. God has nothing to offer people who are in too much of a hurry to consider His words. Read carefully and with concentration to gain the point. Unfortunately, many people go to the Bible with preconceived ideas about what it teaches; others tire quickly when any effort of concentration is required. Remember, the Bible is God’s revelation to man, and that “His thoughts are above our thoughts, and His ways above our ways” (Isa. 55). Therefore, read slowly to get the sense; take time to think upon what you have read; keep a notebook by your side to jot down verses that impress you. And read by plan. We can supply you with a plan of daily readings of the Bible that will take you through the Old Testament once, and the New Testament twice during the course of a year. To follow it properly, you will need to set aside a regular time for Bible reading each day; and you may find that difficult. But persevere. By the exercise of will-power and self-discipline you will be able to regularly set aside the twenty minutes a day that our plan requires, and thus help to read yourself rich in the things of God. Bible reading can become a habit — it is a habit worth cultivating. The word Bible means Book. But it is no ordinary book that you take up in your hands when you pick up the Bible. Notice the two words on its spine: Holy Bible. The word “holy” means separate, and as Bible means Book, you have in your hands a book that is unique from all others. The Contents Page shows it as divided into two parts: the Old and New Testaments. The word “testament” means covenant. The teaching of the Bible is based upon covenants of promise that God made with faithful men in times past. It teaches that “Jesus Christ came.... to confirm the promises made unto the fathers; and that the Gentiles might glorify God for His mercy” (Romans 15:8-9). Again: “There are given unto us exceeding great and precious promises; that by these ye might be partakers of divine nature, having escaped the corruption that is in the world through lust” (2 Peter 1:4). “Beginning at Moses and all the prophets, he expounded unto them (the disciples) in all the Scriptures, the things concerning himself" (Luke 24:27). The Bible will never be properly understood if the Old Testament is neglected. The Gospel, itself, is based upon an Old Testament promise: “God preached the gospel unto Abraham, saying, In thee shall all nations be blessed” (Gal. 3:8). Much of the Old Testament is prophecy, today being fulfilled, or about to be fulfilled. The Contents Page also reveals that the Bible is comprised of 66 different books. It is actually a library of books containing history, poetry, philosophy, prophecy, precept. It reveals the character of God, His message to humanity, His plan of salvation, His purpose for the future. This is not set forth in the dry and sterile form of a creed, but in living records of individuals and nations. It records promises made to them, revelations given them, prophecies proclaimed concerning their future. The Bible reveals man for what he is. You see not an ideal man (except in the Lord Jesus) but the real man. The man revealed to us in everyday life, stripped of all camouflage. An earthy creature; rapacious, cruel, self-willed, governed by desires that God teaches we must learn to control if we would please Him. But not all are like that. The Bible also provides records of men and women who have learned to control themselves through the means that God provides in His word. The Bible invites you to identify yourself with those great heroes of the past, developing a character pleasing unto God, in the sure and certain hope of a resurrection to life eternal. For Godliness “has promise of the life that now is, and of that which is to come” (1 Tim. 4:8). people (Exodus 19:5-6), how He guided them, educated them, revealed His will to them, in order that they might reflect His glory, and that they might be equipped to pass on to others the message of His plan (Deut. 28:9-10). But, as Jeremiah the prophet, sorrowfully recorded, “They would not hear” (Jer. 13:11). In consequence, God disciplined His people. He overturned the throne of David, and scattered the Jews “into all nations” to humble them. But that was to be only for a limited time. The throne was overturned only “until he come whose right it is” to rule over Israel (Ezekiel 21:27). That one is the Lord Jesus Christ. He was born, and died, as “King of the Jews” (Matthew 2:2; 27:37); for his mother was promised that He would reign upon the restored throne of David, over the Jewish people (Luke 1:32-33). “This same Jesus, which is taken up from you into heaven, shall so come in like manner as ye have seen him go” (Acts 1:11). The Bible records how that Palestine was coveted by other nations. It became the battleground of the Egyptians, Assyrians, Babylonians, Persians, Greeks and Romans, as each in turn struggled for world supremacy. Today, Arabs and Jews quarrel over it, whilst behind them, the Communist and Democratic blocs of nations watch their own interests. The land of Israel truly has been described as “the heart of the history of the world." That certainly is the case today: particularly with the world so dependent upon the oil of the Middle East. Israel failed through “lack of knowledge” (Hosea 6:6); but God prophesied that He would restore the people to the land in preparation of great changes in the future (cp. Ezekiel 37:21-22). The modern revival of Israel is in fulfilment of these predictions. It witnesses to the imminent return of the Lord Jesus to the earth (see Psalm 102:13-16). Bible reading can help you to better understand the significance of the great, dramatic events of our own times, for they fulfil Bible prophecy. Though it may be difficult to understand in parts, the Bible is not a dull book. It records many exciting incidents in graphic, dramatic prose. We are appalled at the wickedness of Sodom on the eve of its destruction, and sympathise with the concern of Lot as he tried to awaken his relations to the seriousness of the crisis about to engulf them — to find that this is typical of the times we live in (see Luke 17:26-33). We learn of the glory of Israel in the days of Solomon when it was the mart of nations, and the wealth of the world flowed into Jerusalem, and to the great Temple that was opened there for worship - to find too, that this foreshadows the future (Isa. 2: 2-4). We feel the agony of Jerusalem, as we hearken to Jeremiah’s cry of anguish for the stricken city, smitten because of the wickedness of the people - to find that a merciful God will restore and spiritually rejuvenate His ancient people (see Jer. 31:31-37). There is nothing dull in this Book when it is read aright. The ancient civilisations of Egypt, Babylon, Persia, Greece and Rome pass in succession before us. We learn how that the purpose of God requires the rise and fall of nations (cp. Dan. 2). We hear the groaning of Israelites in Egypt (Exod. 1); travel with Daniel the exile to mighty Babylon (Dan. 1); stand with Paul on Mars Hill below the temple-enthroned Acropolis in Athens, and listen to the Apostle’s stirring exposition of the purpose of God (Acts 17:22-31); listen to the tramp of Roman legions as they march against Jerusalem to destroy it Luke 21:24). The person who derides the Bible as dull has never read it properly! Bible history is a vivid, rapid-moving story. The Red Sea opens up and Israel is saved through water; Joshua marches into the land of Canaan and conquers it in faith matched by courage; Gideon with his selected few destroys the innumerable hosts massed against him, and continues on “faint but pursuing” until victory is his (Judges 8:4); David is elevated from shepherd boy to a world dominion; Amos the herdsman indicts the sophisticated court of the king, and pronounces God’s judgment against wickedness and idolatry; Peter, on the housetop, receives a dramatic vision to teach him that God’s goodness is available to all, both Jew and Gentile; the wonderful message of a risen Christ who is to return again as King over a world at peace, “turns the world upside down” (Acts 17:6), and changes the course of human history. A dull book? Not a bit of it! Consider the writers. They were drawn from every class of society: kings and peasants, doctors and fishermen, princes and herdsmen, poets and laborers, rich and poor, educated and illiterate. Use was found for all. Each in his own way, like the individual instruments in a great orchestra, played his own part to produce a symphony of glorious melody, proclaiming the purpose and mercy of God to perishing humanity. As these servants of God were drawn from all stratas of society, so their writings are designed to appeal to those of all classes. Yet there is no disharmony. Though they were divided by class, period, country, and disposition, there is wonderful harmony in all they wrote. There is no contradiction, no disagreement. Why Contention Over Its Teaching? If such unity exists in the Bible, why is there such disunity among men as to its teaching? Because men have sought to impose their ideas upon the Bible. They have read it with pre-conceived notions in mind, and have searched its pages to find texts to give seeming support to their teaching. The result is religious confusion, and many have turned from the Bible. Contradictory doctrines are dogmatically taught, causing many to give up the search for truth in despair. But the way of life eternal has never been easy. It has ever imposed a challenge on those seeking it. In the past, men were challenged with active persecution; today they are met with ridicule, apathy and error. In previous days the Bible was burned, and men threatened with the Inquisition if they dared set forth the truth; today they have to manifest moral courage in the face of opposition, confusion and scorn. The Bible foretold that this would be the case. It predicted that the time would come when the so-called Christian world would be as antagonistic to its truth, as was the Jewish world in the days of the prophets. “The Spirit speaketh expressly, that in the latter times, some shall depart from the faith, giving heed to seducing spirits, and doctrines of devils; speaking lies in hypocrisy; having their conscience seared with a hot iron; forbidding to marry, and commanding to abstain from meats, which God hath created to be received with thanksgiving of them which believe and know the truth” (1 Tim. 4:1-3). One of the wealthiest and most popular churches of Christendom has been noted for forbidding its priests to marry and commanding its followers to abstain from meat on certain days. The Bible predicted that this would be the case, hundreds of years before Catholicism decreed this as the policy of the church. It demonstrates that a church can be styled “Christian, “ and yet reject the principles of Christ. “The time will come when they will not endure sound doctrine; but after their own lusts shall they heap to themselves teachers, having itching ears; and they shall turn away their ears from the truth, and shall be turned unto fables” (2 Timothy 4:2-4). This is a warning against seductive doctrines taught in the name of Christ, but which do not conform to his true teaching. Christ, himself, distinguished between a “true worshipper” and a false one, and declared that God seeks those to worship Him who do so “in spirit and in truth” (John 4:23). The responsibility for carefully sifting the evidence, and separating the true from the false rests upon each one as an individual. Some teach that it does not much matter what we believe, so long as we are genuine in motive. They allege that so long as we accept that Christ lived, died, and rose again, so long as we manifest a little “Christianity, “ read a little of the Bible, go to church occasionally — all is well. The Bible does not speak that way. It declares that a sound belief of the simple fundamentals of God’s purpose is essential to salvation. It teaches that the Gospel is “the power of God unto salvation, to everyone that believeth” (Rom. 1:16); that “life eternal” is bound up in a correct understanding of the truth “concerning the only true God and Jesus Christ” (John 17: 3), and that “without faith” (which comes from “hearing the word of God” - Rom. 10:17), it is “impossible to please God” (Heb. 11:6). “Go into all the world, and preach the gospel to every creature. He that believeth and is baptised shall be saved; but he that believeth not shall be condemned” (Mark 16:16). “I preached unto you (the Gospel), which ye have received, and wherein ye stand; which also ye are saved, if ye keep in memory what I preached unto you, unless ye have believed in vain” (1 Cor. 15:1-2). These scriptures clearly show that God requires His servants to understand and believe His purpose, as a condition of salvation. Why does He demand this? Because His primary intention is not merely to teach us or to save us, but to change us. He does this through the moral example of Christ, and the influence of his teaching. Both are designed to wean us from the flesh, and reveal divine character-istics in us. Christ, himself, prayed on behalf of believers: “Sanctify them through Thy truth; Thy word is truth” (John 17:17). The Bible is designed to change us mentally and morally, in preparation for a physical change to life eternal at Christ’s coming. That is one reason why the Bible is somewhat difficult to comprehend. God desires us to “think” upon these things (Phil. 4:8), that our “profiting may appear to all” (1 Tim. 4:15). The Bible is designed to cause us to think in conformity with God’s ways, and so change our way of life.